What better way to remember a departed love one than with this handsome personalized memorial cross that will help him/her stay close to your heart? 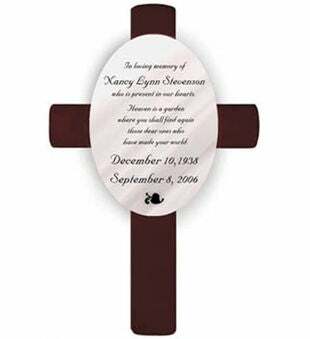 Suitable for a number of uses, including as a remembrance at a special occasion such as a wedding, these attractive wood composite crosses are deep burgundy in color. Cross measures 11" x 7" x 3/4"